This Report and its accompanying inventory volumes and base maps together form the end product of a contract between the National Park Service and Shepley Bulfinch Richardson and Abbott. The purpose of this contract was to inventory and begin an architectural and socioeconomic interpretation of the cultural resources of the Lowell Historic Preservation District and the Lowell National Historical Park as represented by the 895 individual properties which exist in the District and Park. The project commenced in March, 1979, and was completed in January, 1980. 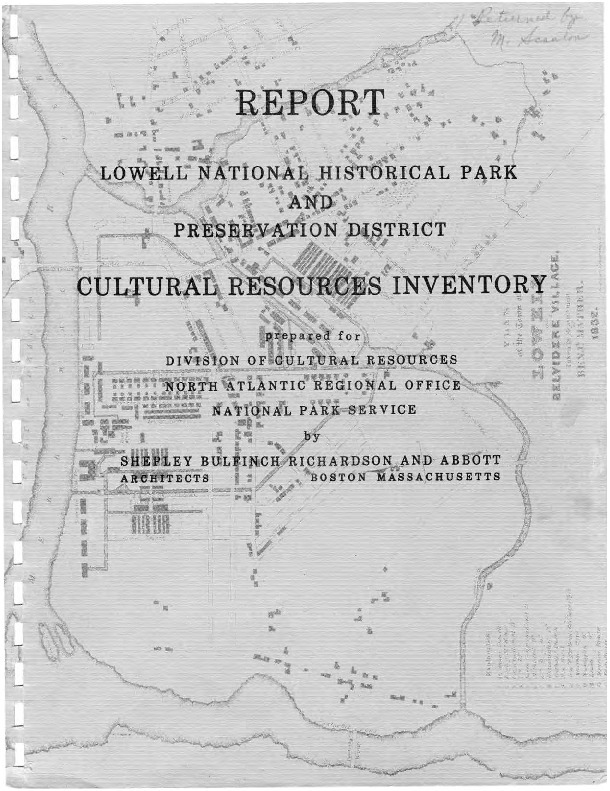 Citation: Shepley Bulfinch Richardson and Abbott, “Lowell National Historical Park and Preservation District: Cultural Resources Inventory Report,” Digital Initiatives @ UMass Lowell, accessed May 18, 2016, http://lowellhistarch.omeka.net/items/show/1784. Prepared by Elizabeth Durfee Hengen as part of a Neighborhood Cultural Resource Inventory jointly funded by t he City of Lowell through its Community Development Block Grant program and the Massachusetts Historical Commission through the National Historic Preservation Fund. Citation: Elizabeth Durfee Hengen, “The Lowell Neighborhoods: An Historical & Architectural Overview,” Digital Initiatives @ UMass Lowell, accessed May 18, 2016, http://lowellhistarch.omeka.net/items/show/1785.